We are a team of students at the University of Nebraska-Lincoln studying agronomy, statistics, and computer programming. Being from the Midwest, and largely from agricultural backgrounds, we know firsthand the importance of collaboration between producers, researchers, and consumers in successful farming operations. Technological advancements have led to a more productive and sustainable food system, yet large gaps still exist between the collection and analysis of data, and distribution and implementation of new ideas. We were inspired by the opportunity to integrate USDA data and translate it into a user-friendly and accessible application that puts it in the hands of farmers. We believe that many farmers understand the need for long-term environmental sustainability, but find it challenging to maximize their profits with this goal in mind. 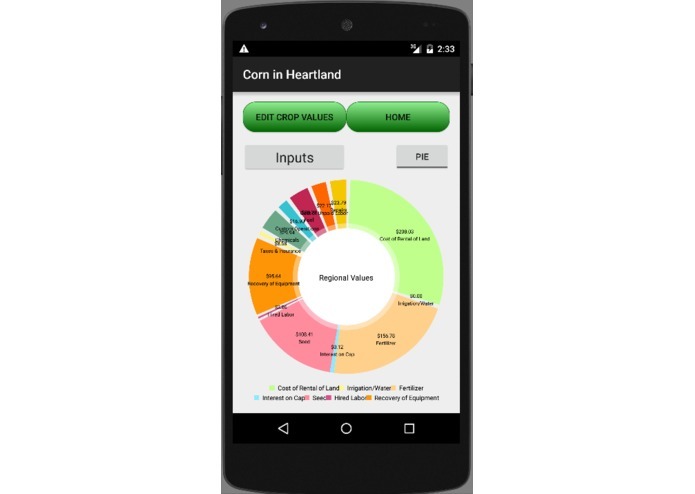 With this tool, we hope to help farmers focus on being both profitable and sustainable. 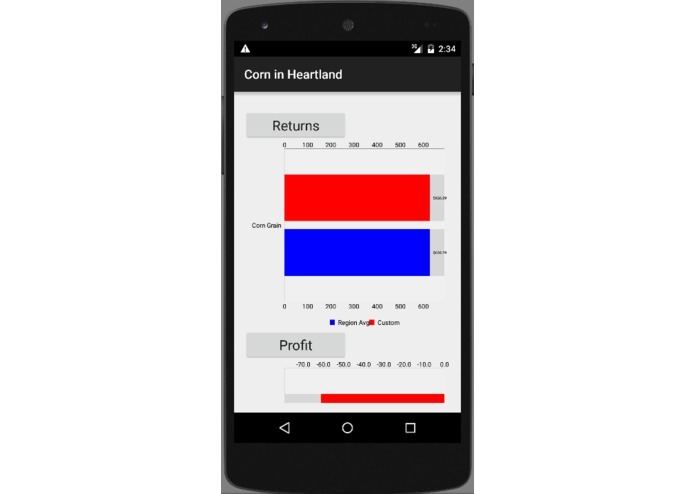 Farm Profit Calculator gives farmers a tool to understand how to maximize financial efficiency for their operation. We want farmers to get the most bang for their buck, and learn where they can reduce inputs without affecting their bottom line. 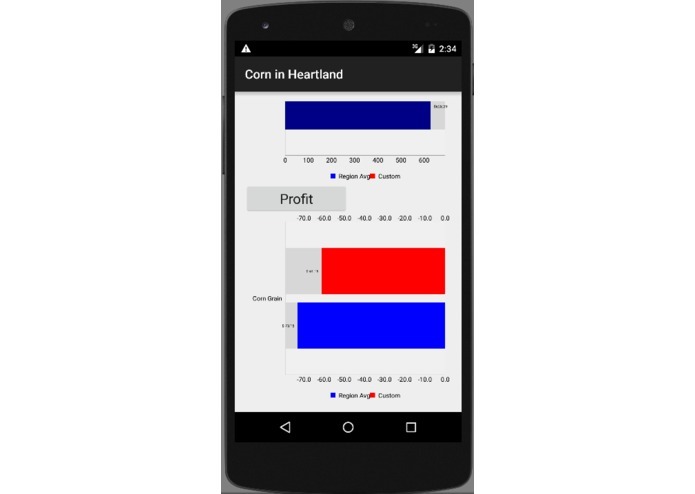 Farm Profit Calculator uses USDA regional production cost and yield data along with user input values to estimate profit based on current or future grain prices. 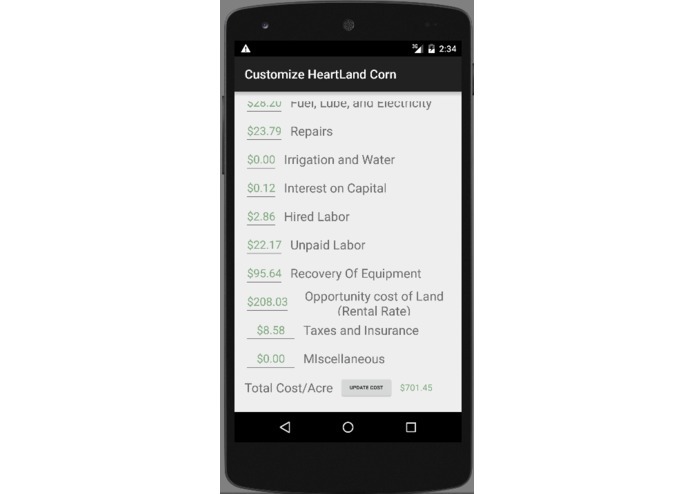 This app gives users a full breakdown of operational costs and gains for a whole operation or on a per-acre basis, starting with average data for their region. We built this application using an XML layout and Android API levels 18-23 for widespread Android use. SQLite was used for storing user input data as java files so that there is no need to request a foreign server and so that we have easy object creation and repetitive use. We built this application to be user-friendly on a mobile and accessible platform with a focus on a concise build. The biggest challenge we ran into was balancing our big ideas with realistic outcomes on a tight timeline. As a small team, we have one talented student programmer and a lot of big ideas that we were unable to incorporate before submission. We are, however, driven to continue working on our application in an effort to help bridge the gap between data and farmers. We are most proud of how we came together as a team to produce a finished product. When we had our first development meeting, we each had a different idea of what the app could be. We talked through each idea, trying to envision how we could accomplish those goals in the allotted time period. By the end of that meeting, we came to an agreement that the Farm Profit Calculator was the most exciting and feasible idea. Throughout the development process, we supported each other’s ideas and maintained a collaborative, positive working environment. Considering that this was the first app we developed, we are extremely proud of this. The process of developing this app on a tight timeline forced us to balance our big ideas with realistic outcomes. We had countless ideas for the app, but when it came time to start programming, we had to sit down and decide what our central goals were. The act of having to focus our ideas was a great learning process because it forced us to decide what would be most helpful to farmers. Some of our soon-to-be incorporated features include multiple platform expansions including iOS and Windows mobile. We are also working to build in automatic location selection based on GPS coordinates and instant yield and commodity pricing for the area and local grain buyer. 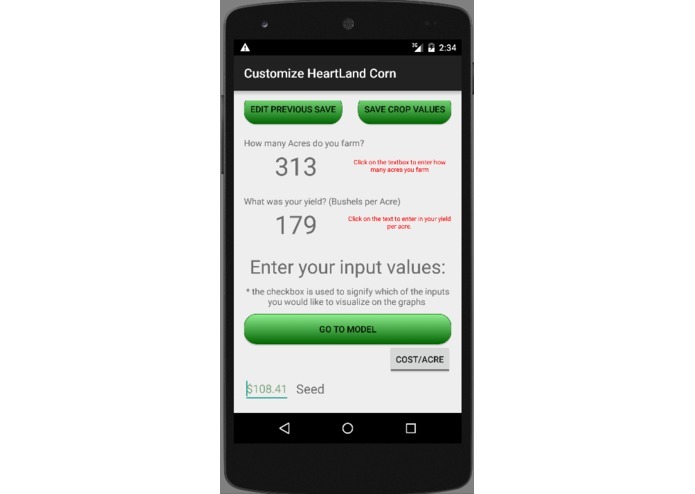 We hope to add a cost analysis section to better educate where money and inputs can be saved. We are eager to get this app into the hands of current and future farmers, whose feedback and experience could make this app even better. 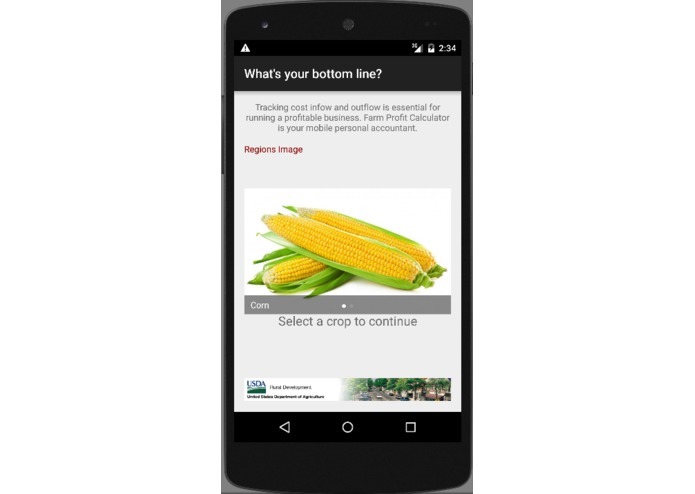 Our involvement with the University of Nebraska gives us the opportunity to test this application with agronomy students during classes as well as farmers during extension education events. The app can be utilized as a powerful education tool by analyzing hypothetical real-world scenarios. We are excited to learn more and continue updating and adding new features to this application. I was the software developer behind the application using Android and Android Studio.